Table 1 presents outcomes of six series of transperitoneal laparoscopic radical nephrec-tomy. Tumor size and stage and perioperative parameters including blood loss and length of stay are presented. Results of laparoscopic radical nephrectomy are similar if not better than traditional open radical nephrectomy. As with any relatively new procedure, most authors describe a learning curve, with results improving over time. Comparative series show a trend with experience to shorter operative times and less blood loss. In addition, the indications for this procedure continue to grow as surgeons treat more complex presentations including larger tumors. Nevertheless, there is a growing enthusiasm for laparoscopic nephron-sparing surgery to treat smaller lesions. Complications associated with laparoscopic radical nephrectomy are similar to those associated with open surgery (Table 2), including injury to adjacent organs, bleeding, infection, port site or wound herniation, peritonitis, and postoperative ileus (9,22-27). aThree cases were intentionally combined retroperitoneal and transperitoneal. Abbreviations: OR, operating room; I, intact; M, morcellated. 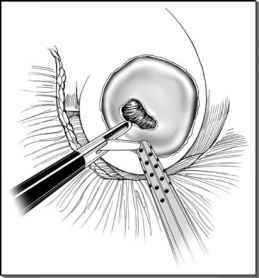 Specimens can be extracted either by extending the umbilical trocar site incision or with a small suprapubic incision. Transvaginal extraction has also been reported. Complications with laparoscopic radical nephrectomy are similar to those associated with open surgery, including injury to adjacent organs, bleeding, infection, port site or wound herniation, peritonitis, and postoperative ileus. Complications occurring during transperitoneal laparoscopic nephrectomy are slightly different compared to retroperitoneal laparoscopic nephrectomy. During dissection of the renal hilum, the renal vein, may require retraction to allow adequate visualization of the renal artery. Aggressive retraction, particularly on the left side, may lead to bleeding from venous tributaries. This is usually not an issue when employing a retroperitoneal approach. crush injury proximal to the clips and hemorrhage. In addition, EndoGIA misfire can occur if a dense structure (i.e., fibrotic or calcified vessel, adjacent metal clip, etc.) is inadvertently caught within the jaws during engagement. Precise dissection of accessory vessels minimizes intraoperative blood loss. The complications occurring during transperitoneal laparoscopic nephrectomy are slightly different compared to retroperitoneal laparoscopic nephrectomy. In fact, during dissection of the renal hilum, the renal vein, which is commonly anterior to the renal artery, may require retraction to allow adequate visualization of the renal artery. Aggressive retraction, particularly on the left side, may lead to bleeding from venous tributaries (including the adrenal vein). This is usually not an issue when employing a retroperitoneal approach. There is also a decreased risk of trauma to intra-abdominal organs when using the retroperitoneal approach.